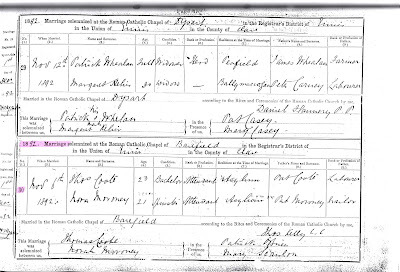 I was surprised, when looking at Irish census records, to see that my mother's grandparents, Thomas and Honora Moroney Coote worked at the District Lunatic Asylum, known as Our Lady's Hospital, in Ennis, County Clare, Ireland. 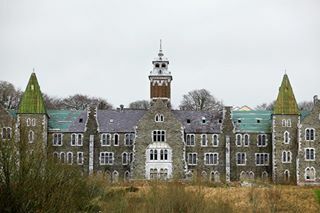 The hospital, if you can call it that, first opened in 1868 and was one of the smaller district asylums. The care takers were really just custodians of the inmates as there were no real treatments for persons with mental illness in those days. In a census taken in 1871 the population of Ennis was 26,530. In a breakdown the census reveals that there were: 50 Idiots in the asylum and 31 at home, 176 Lunatics in the asylum and 19 at home, 428 paupers in the workhouse, 66 paupers receiving home care and 154 beggars and vagrants. The labels are cringe inducing but those were the official names in the day. The Hospital was terribly overcrowded and staff to inmate ratios were high. The Hospital was a large employer for the town and was also a large purchaser of local produce. 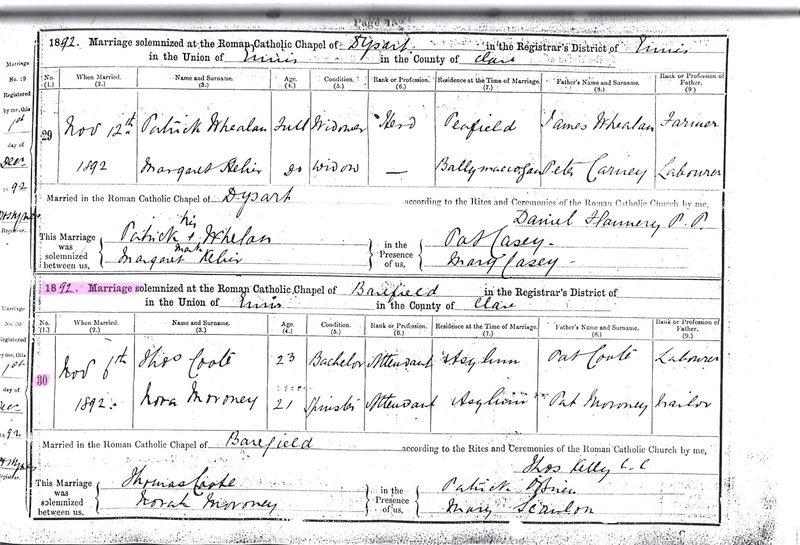 Thomas and Honora were working there in 1892 when they got married, they were listed as Asylum Attendants. He continued to work there after the marriage. The hospital closed for good in 2002. All their documents have been archived by the County Clare Library but are not available online.